The countdown for the annual Webby Awards, aka the Oscars for the Web, has started: there are ten more days left to cast your vote. (Voting stops at the end of April.) This year, one of the more interesting nominees, in the category of ‘Best typography’, is Wordle. Wordle has been created by Jonathan Feinberg, who works for IBM Research. It is a type of tag cloud (we have one on this blog here). If you are not familiar with what a Wordle looks like, here is an example of one I have made from Stephen’s post last week. 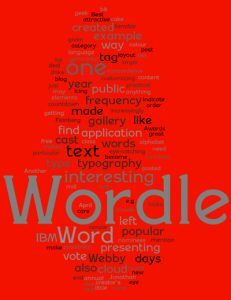 You will also find a great deal more in Wordle’s public gallery. Word clouds made by Wordle indicate the relative frequency of words in a given text by showing them in larger type. What makes a Wordle more attractive than your run-of-the- mill tag cloud is the possibility of customizing various elements: in what order the words are shown (e.g. frequency, alphabet), font and colour usage, layout, to mention a few. The icing on the cake is that you are free to do anything with it once it’s been created. In its creator’s eye Wordle is a ‘toy’ and at that a very eye-catching one too. Like me, you may wonder though at the practical application of such a program. Not surprisingly, I have found that Wordle has become more than just a gimmicky tool (or nice little application if you prefer), and is getting increasingly popular with teachers, not only as a new way of presenting language, but as a way of presenting content for other topics too. This particular teacher has posted 20 interesting tips for using Wordle in class. A word of warning: Wordle does not censor the text for you so you need to take care in selecting the text or wordle from the public gallery. Being a bit of a ‘word geek’ and a fan of typography at the same time, I think I’ll cast my popular vote on Wordle this year. You have 10 more days left to make up your mind. On this website there is a whole list of tools for text visualization. Another example I find interesting is Word Trees (also courtesy of IBM), a visual version of a concordance.